These balls are so full of goodness, I refuse to call them sweets. They surely satisfy a sweet tooth, but that's just a nice side effect of this otherwise super healthy and nutritious power package. I am not a big fan of Goji berries eaten just by themselves. There is a funny aftertaste that I don't like. In these balls, however, they taste fantastic. Combined with seeds, nuts, honey, dark chocolate and other dried fruit you'll get a whole variety of crunches and flavors. Depending on your preferences you can omit or add one or the other ingredient. Goji Berries have a long list of health benefits, like all berries. Goji berries in particular, however, are age-defying due to their unique combination of their minerals and vitamins. In fact, that was the reason why I was trying so hard to find a recipe with Goji berries that I would like. 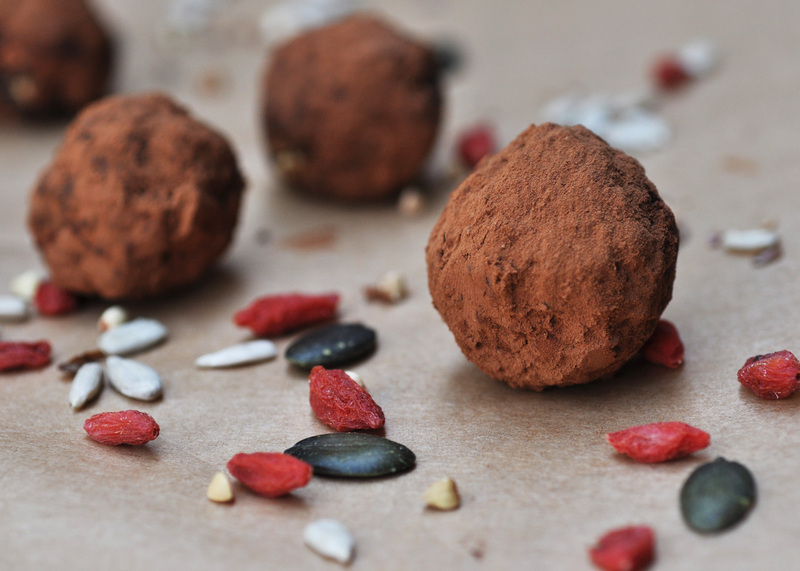 These ball are a perfect snack for mid-morning munchies, and a great treat after a workout. To me, they served pretty well as after-dinner pralines on the sofa. Combine all ingredients in a food processor and process until combined and sticky. Form balls of the size of a walnut out of the batter. Roll in cocoa powder or coconut flakes.